Comfortable in your hand and easy to use. 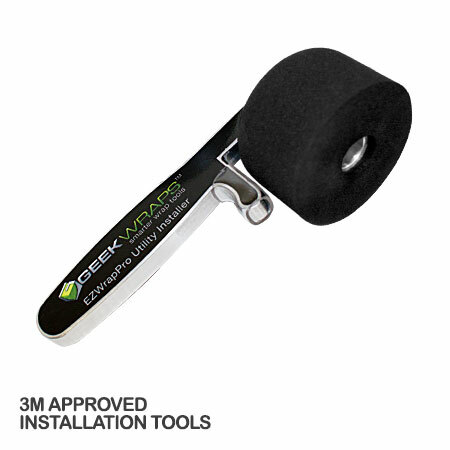 Crafted from the same aircraft grade T-6 aluminum as our other EZWrap Pro installers, with a solid 1" diameter aluminum hub supporting the 2" high density foam roller, this is a tool that can be used in a variety of circumstances during your installation. 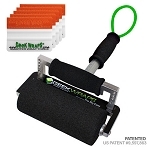 Used with a heat gun or torch, it can lay down rivet lines, and the side axle support design allows it to snug up next to an edge to complete a rivet line or just secure the vinyl at a corner edge without the supports hitting the side walls or scratching the vinyl. The handle can be used to hang it in your pocket when not in use. Not advised for calender vinyl.